I originally meant to alert a friend about this book and ended up being completely surprised by the scope of the book and it's rapt attention to history, which is my first love. Prior to the dawn of the 18th Century and into the early 1700's scientists were of the notion that plants did not reproduce sexually. They held forth a myriad of scenarios by which plants were replicated. Thomas Fairchild, a nurseryman in England, could not have disagreed more. Fairchild took it upon himself to cross pollenate a Carnation with a Sweet William and a new species was born. and became the first real merchant of garden plants as we know them today. But this was just the beginning. Ms Wulf traces the the English love of gardening through history- including the Voyages of Discovery by Sir Lord Banks and his journey around the world- only the 2nd Western vessel to round the Horn of Africa and on into the Indian Ocean, all the while gathering more plants and specimens. Captain Cooks voyages are chronicled, as well as the acquisition by Lord Banks of the famed Linnaeuss collection from Sweden, all in a most readable style and engaging format. The book is illustrated throughout and contains a superbly cross referenced Glossary for the uninitiated gardener. With an extensive Bibliography this is a book, that while about garening- is about so much more. 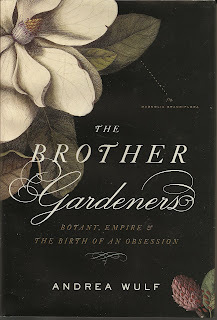 I highly reccommend this book for the Amatuer Gardener as well as the Armchair Historian.